Etymology: Pyracantha comes from Greek " pyros " which means the fire and "Acantha", the thorn, because of its sharp thorns. The presence of thorns is a characteristic sign of Pyracantha. Origin: Southern Europe and Middle East. Other species are from Asiatic origin (see more low). 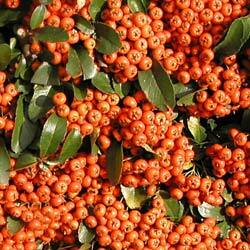 Habitat: Pyracantha is tolerant in soil. A neutral soil, humus and well drained fits well. It supports the limestone. It prefers a sunny position or half shade. Hardiness: zone 7 (it supports cold until -17 °C or 1 °F). Protect roots with a mulching if there is a risk of strong frosts. Bark: grayish which cracks with age. Persistent foliage. Small leaves of 2 to 5 cm long, lanceolate, leathery, glossy, light green (young leaves) to dark green, paler on the underside and glaucous; edge finely dentate short petiole. Young shoots are reddish. Most of the long spines of the year become the branches of the following year. Flowers: small white flowers grouped in corymbs, appearing in April (in May in zone 8) until June. They are formed of 5 sepals, 5 rounded petals, 20 stamens and calyx pubescent. They are fragrant and attract the honeybees. Fruits: small berries, fleshy, red or orange, in ovoid form, containing 5 stones. They persist until next spring. Fruits are appreciated by birds, notably blackbirds. Use: Pyracantha can be trellised against a wall or in a free hedge or drives in topiary. Berries are decorative in winter. Because of its long thorns, Pyracantha is dangerous for the children and the gardeners. It is often used in defensive hedge for isolation from wildlife. Toxicity: Berries are toxic. It is necessary to avoid swallowing them at the risk of nausea, vomiting, mouth dries, abdominal pain, widening of the pupils. Leaves and roots have the same risks of toxicity. Propagation: by cutting of stems hardwood at the beginning of summer or by layering in spring. The seedling of cool seeds is also possible in autumn. It is better to plant Pyracantha spaced out by 80 cm by foot because it has a spread form. Prune (maintenance): prune Pyracantha reasonably from April till June to maintain the shape. A strict pruning sensitises him in the fire blight. Use gloves because of stingings. The light pruning at the end of the summer till the end of October is taken back. The mark (spilocaea pyracanthae) is a mushroom which causes the fall of leaves and the appearance of black stains on berries. 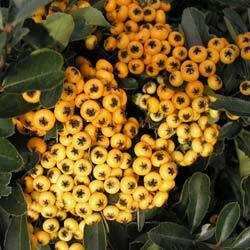 Pyracantha angustifolia : native to Western China, 3 to 4 m high, spreading, downy gray underside of foliage, yellow-orange berries. Pyracantha crenulata : native to Asia (Himalayas - Nepal), upright form, 3 - 5 m tall, dark red berries. Zone 7. Pyracantha crenatoserrata : native to Western China (provinces of Sichouan, Yunnan), about 3 - 4 m tall, oblong, squalid orange foliage, berries turning to the red. Zone 6. Pyracantha densiflora : native to China. Pyracantha heterophylla : native to China. Pyracantha inermis : native to China (province of Yunnan and Laos). Pyracantha koidzumii : native to Formose, Taiwan, berries of an orangy red. Zone 7.